At Montreal Kanreikai Karate school, we promote the practice of karate as a fitness activity, a mean of personal groeth and even a path toward competition. We teach karate in a friendly environment filled with respect and mutual help. 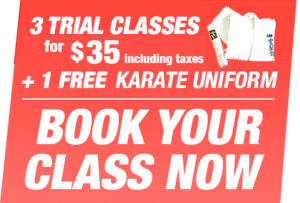 Adults, kids, teenagers, you will find karate classes that meet your needs at our Pierrefonds karate school. An increasing number of martial arts classes are available in Montreal West Island. Consult our schedule and find out the various types of karate classes we offer according to each student’s age or level of abilities. As it is never too early to start, we offer karate classes for children aged 4 to 6 years old. Your child discover the world of martial arts while havin fun. Why not start karate at the same time as your children by taking part in our program of Karate for the Family? Your opinion matters to us and we want to answer all your questions about our karate classes and our karate school in Pierrefonds, in Montreal West Island. Do not hesitate to leave us a message. We will answer you as soon as possible by phone or email. We favor a good communication with all our current and future members, whether it is for an information, a comment, a suggestion… or to say Hello! Thank you also to take a moment to leave a comment on our site.